The full armor of God is a metaphor. And we must remember it’s for standing (like a palm tree), not advancing into battle. And, in my mind, it works from the inside out. And for the armor to work 100%, it requires me to embrace the Holy Spirit. The first three aspects of the armor are truth, righteousness and peace. Like a belt, truth holds the whole thing together. This means my speaking and thinking truth as well as adopting God’s truth. When truth is bent, then the protection has chinks. The breastplate (not commonly worn in modern times) protects the heart, one of the most vulnerable parts of the body. And how do we protect this heart? With right actions with fairness, honor, justness, and devotion to the One who embodies these traits. This typifies the sowing and reaping principle: we receive back what we give out. And the converse if true. I cannot expect my heart to be protected if I am grieving the Holy Spirit. The third essential is “gospel of peace.” Why isn’t it just peace? Because it’s the message of peace itself that has the power. It is foundational (like feet) and carries great weight. Peace is an outgrowth (the promise) out of the mysterious work of the Christ. When I walk in peace, I bring peace with me. 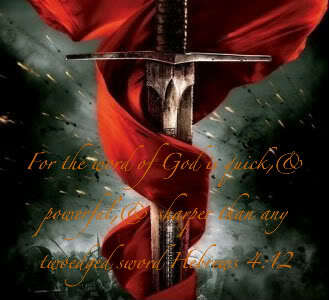 The last three pieces of the armor are faith, salvation and the word of God. Faith is called a shield for good reason, it is literally held up to withstand direct attacks. What’s interesting to me is the use of the verb “extinguish.” This means that faith can actually neutralize or put out fires. This, next to right living & behaviors, is my strongest defense. Salvation is the description of a state of being. This state comes from my acceptance of Christ as the “head” of my life, the captain, the tactical center. Thus, the helmet is an apt description. Salvation is not about my “doing” anything. I am not to be about head-butting. It’s security. And lastly, the sword which has been interpreted as the Bible itself and as a result, people have used this understanding as a case for aggressively cutting others with it. People memorize verses and apply them to as many situations as they can, ostensibly to cut through the circumstances. But, I think it can interpreted as the word within that comes directly from the presence of the Holy Spirit. The sword works together with the shield. The sword does not have to be an offensive weapon, it can block and extinguish as well. The word of God is knowledge and wisdom and truth. The circle is complete. Remember: the goal here is to stand! So, here I am Lord. Forgive me for lashing out with the sword before the rest of my armor is in place. May standing in truth, righteousness, and peace be my first priority today.